The Origin is a great mic that comes at a fantastic price. 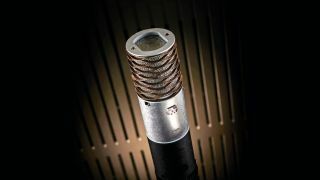 A high-performance cardioid condenser mic is on pretty much every producer's must-have list, and Aston Microphones' Origin is precisely that. This retails for £199, but the good news is that the company has four to give away to MusicRadar users. The Origin is a versatile mic that can be used to record pretty much any instrument you like, but is particularly adept at capturing guitars and vocals. It features a hand-selected capsule teamed with high-end transformer-less circuitry, and Aston tells us that only the finest components have been used in its creation. Other highlights include Aston's signature waveform mesh head, which delivers an unprecedented level of protection for the Origin's capsule, and gives the mic a distinctive and impressive look. This head also includes a random weave mesh-knit pop filter that allows sound through but eliminates unwanted plosives at source. In fact, you'll find that Aston has focused on the finer details all over the Origin. The custom-moulded end caps feature a unique integrated XLR and stand adaptor (meaning that the mic can go straight onto a stand), and each Origin chassis is 'tumbled' for up to four hours to give it a hard-worn, lived-in look. To be in with a chance of winning an Aston Origin, head on over to the competition page and get your entry in. The competition is open until 8 April, and the four winners will be chosen at random. If you like the look of the Origin, Aston Microphones politely requests that you give the company a Like on Facebook!